Until now, the literature on innovation has focused either on radical innovation pushed by technology or incremental innovation pulled by the market. 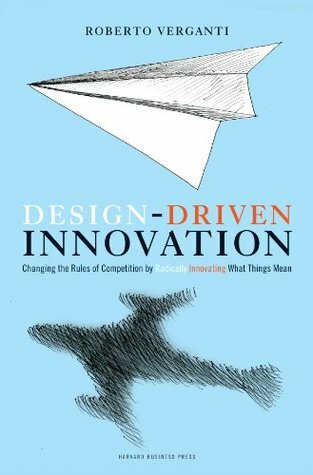 In “Design-Driven Innovation: How to Compete by Radically Innovating What Things Means”, Roberto Verganti introduces a third strategy, a radical shift in perspective that introduces a bold new way of competing. Design-driven innovations do not come from the market; they create new markets. They don’t push new technologies; they push new meanings. It’s about having a vision, and taking that vision to your customers. Think of game-changers like Nintendo’s Wii or Apple’s iPod. They overturned our understanding of what a video game means and how we listen to music. Customers had not asked for these new meanings, but once they experienced them, it was love at first sight. But where does the vision come from? With fascinating examples from leading European and American companies, Verganti shows that for truly breakthrough products and services, we must look beyond customers and users to those he calls ‘interpreters’ – the experts who deeply understand and shape the markets they work in. “Design-Driven Innovation” offers a provocative new view of innovation thinking and practice. Good Cases: All the stories / examples are interesting, and the dynamic nitty-gritties are pointed out, e.g. the highly circumstantial success of Fiat Panda. Biased Opinion: In order to make a strong case for Design-Driven Innovation (DDI), the author has to antagonize the whole discipline of User-Centered Design (UCD). UCD is described as something similar to asking the users what they want, which is scandalously biased. It’s true that UCD puts emphasis on users, but that in no way implies we can not articulate or facilitate brave new insights by understanding the users and their contexts. Thus DDI is actually NOT in any conflict with UCD. The author takes a very narrow view of UCD just to highlight how different DDI is, which a shame. Trivial Theory: The framework the author presents is vague and close to truism. Saying something like “to implement disruptive innovation you need to gain the right insights, find the right people, etc.” is similar to saying “to innovate you need to be innovative”, which doesn’t really yield any more useful information. Although the characteristics of successful radical innovations in the past are summarized, that alone by no means affords a proven theory – it’s just a déjà vu case of correlation vs. causation. Just because many radical innovators have something in common doesn’t justify that you can follow the same rule and succeed. The book has a promising point that I can totally agree with, but the author simply fails to deliver anything convincing to make that point.